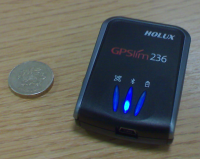 My Holux GPS receiver arrived yesterday from nav4all, which finally let me try TomTom Navigator 6 on my P990i. Whilst it’s still not officially supported by TomTom, if you buy the software it comes with an option to install on a UIQ3 phone. The install process is really easy. Just put your memory card in to your computer and run the install DVD. You’ll then need to put the memory card in to your phone, which will start the phone installer. 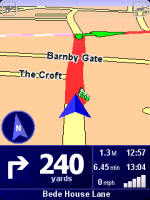 After selecting maps, languages and my new GPS receiver, TomTom found me in my house. With favourites and points of interest this morning I was able to get to David’s and be warned that there was a 30 mph speed camera (thanks PocketGPS World). However en route to work I was informed that the A46 between Lincoln and Newark is 30 in some places, yet it’s 70 the whole way. If anyone is looking at running GPS via their phone, grab a Holux 236 from nav4all whilst there are still €70s as it’s worth every penny. The image on the right was the coverage inside my office, and it actually got better finding 8 satellites, minutes later. You managed to install it from the DVD without any problems ? I keep getting a message that the security certificate has expired, hence I cannot install it. Any suggestions? Tom-Inge Nilsen, if you search the DVD you should find a uiq3.cab file. Use WinZip to unpack the file and drop those directly onto your memory card. Which platform of tom tom did you buy? Is that the one for PDA/Mobile navigation i presume? I’ll be damned. It worked. Formatted my memory stick from the p990i, and then unzipped all the contents of the uiq3 file to the memstick. Then it installed like a charm, and asked for maps and voices, which I am now installing. Thank you so much! It does NOT work installing it from TomTom Home on the memstick… At least not for me, it generates that silly expired certificate error.. Anyone had problems activating the maps, everything loaded OK, but when I tried to activate, it said it was not valid for that map. Phoned SE they said not compatable with the P990i. Help please. 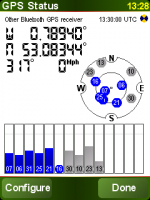 James, I had problems with my original GPS unit (some cheap thing from MobileFun). So I got a Holux GPSlim236, sold the old one and it works perfectly. I can’t comment about the new firmware as I’m waiting for Vodafone to release it.